With so much to see on the internet these days, it's a wonder we find time to eat and sleep – let alone finish our cuppa. Well we're not going to be limiting our Lolcats anytime soon. 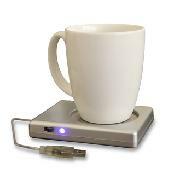 So for all those who are equally hard at work, we’ve found the USB Cup Warmer. Especially handy if your boss keeps the office at a 'productive' 12 degrees, this ingenious device keeps your hot drinks hot for longer. Just plug it into your computer’s USB port and pop your cup on top. Thanks to the handy warming element inside, it'll give you all the time you need to LOL, ROFL, LMFAO or ROFLMFAO between slurps.